It’s certainly not the first time several authors collaborated to write one book, but I believe it might be the first time I have read a novel written by multiple authors. 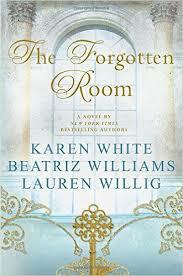 The long-awaited The Forgotten Room was authored by three well-known and prolific fiction writers, Karen White, Beatriz Williams, and Lauren Willig. The three “W’s”. Not too complicated to figure out how to alphabetize on the cover. 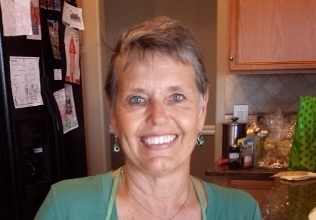 Willig is the author of a number of historical romance novels; White has written somewhere in the neighborhood of 20 novels, most taking place in the Low Country of South Carolina. Beatriz Williams has authored five or six period novels. I recently reviewed Tiny Little Thing, which may be one of my favorite reads of 2016 (though I recognize it’s only March). I don’t know the back story of how these three authors came to write a novel. Nor do I know how they decided who wrote what. The details have been purposely kept secret. The Forgotten Room is about three women in three different decades, all united in some way by a ruby necklace and a room in an upper New York City mansion. Olive lives in the late 18th Century, the daughter of the man who designed the house, but was mysteriously fired and subsequently committed suicide. She becomes a maid for the family living in the house to find out why her father was fired and never compensated for his work. A decade or so later, her daughter Lucy rents a room in the mansion, which in the Roaring Twenties has become a boarding room for women. Her goal is to find out who was really her father. And finally, Lucy’s daughter Kate, a physician, treats patients in the home which has become a hospital for returning war veterans. All three women own the necklace at some point, and all three women have history in the forgotten room in the mansion. I wanted to like this book. I expected to like this book. I liked the idea of this book. I just didn’t find myself drawn into the story. As mentioned earlier, the authors have not revealed how the book was written. They purport that it was written in round robin style as opposed to each author taking charge of one of the characters. I will say that the writing styles were seamless. I couldn’t tell who wrote which chapter. But I will also tell you that I just didn’t ever grow to care one bit about any of these three women. Their stories were illogical and implausible. I am fully willing to ignore the implausibility that takes place in most romantic stories. This time, I just couldn’t forgive it. Each author has a novel coming out soon, and I can’t wait to put this one behind me.